Famous for its refreshing subtle flavour, our Moonlight White is widely considered China's finest white teas. Amongst white teas, this is the most expensive variety and the most prized, as only unopened leaf buds are used to produce the tea. Our Moonlight White Tea is grown in Fuding, where it is harvested on only a few days each spring. Moonlight White is known in China as Baihao Yinzhen (white hair silver needle) and is famous for its fresh, delicate flavour. Moonlight White produces a straw coloured liquor with a delicate, floral aroma. Its silky mouthfeel is complemented by a subtle sweet flavour, with hints of cucumber and melon. 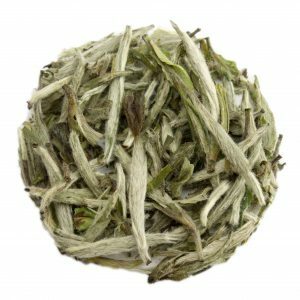 Moonlight White has a sweet, lingering aftertaste that improves with each infusion. Can be infused at least 3 times.